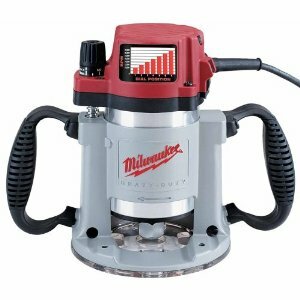 While they come in many options, you are going to find that Milwaukee wood routers are going to offer you the chance to explore an exceptional piece of equipment that is going to help you with your woodworking. With a series of award winning options, you are going to find that this line of wood routers will help you to make an actual impact on your wood working goals. One of the first things you are going to find is that the Milwaukee wood routers tend to have a high level no load RPM that will help you to work with harder woods that many woodworkers enjoy using, such as maple. When you combine this will adjustable collet sizes in their models, you can begin to understand the benefit of choosing this brand. Along with this, most people tend to enjoy the smooth operation that is backed with a relatively low amount of sound. In fact, most users of these routers tend to find that the vibration is minimal and this allows you to get a more precise cut on the pieces of wood that you are working with. When you add in the depth adjustment features that these come with, you will find that you are able to handle bigger projects in a very effective manner. When you are looking at the different Milwaukee wood routers, you will need to keep in mind that their BodyGrip technology will allow you to maintain better control when you are working with wood. In some cases, this can make the difference between a mediocre piece and one that is going to truly shine. Best of all, the Milwaukee brand is going to provide you with one of the safest wood routers available on the market. This will help to reduce the risk of injury and provide you with a safer experience overall in this process as well. One feature is the double insulation that reduces the risk of getting an electrical shock while you are using this tool. There is little doubt that if you are looking for a powerful tool, the Milwaukee wood routers available can be a good choice for you. With a 5 year warranty on most of their models and a proven track record, there is no doubt that you are going to find that this remains one of the best choices you have for all of your woodworking needs. Keep in mind though, if you are looking for a product that is American made, this is going to be a little misleading. The truth of the matter is that this product is made in China. However, this is a high quality line of products and you are certainly going to want to consider it as one of the top choices that you have. In fact, you just might find that it is the best wood router you have ever worked with. Return From Milwaukee Wood Routers Page to Home - Finishcarpentryhelp.com.